Hello, I hope you enjoyed our hot Wisconsin summer. We have several things to report to you. It’s been a busy season even though you can’t tell that from where you are, but we’ll give you a run-down. This newsletter is being published on our updated website. We’ve contracted with a professional, Wisconsin Web Writer, to design it and if necessary maintain it, which means making the changes to it as we have new things to report. The address is www.WisconsinGreatLakesCoalition.org. The newsletter will be available on the website, but we realize many of you don’t have e-mail, so there’ll be a regular USPS delivery for you. You can also use the website to pay your dues or make a donation. If you’re not comfortable with making financial transactions on the Internet we’ll gladly take your check. Or cash. Or piggy banks. Just mail them to our Oostburg address (see above). We are beginning to outgrow the more locally-based groups; our efforts have been aimed at higher and higher goals, such as our involvement with the International Joint Commission (IJC), the DNR, and our state legislature. Our main concern, and reason for tweaking our scope, is that there are dozens, probably hundreds, of groups out there who focus on local or regional issues, but no-one seems to be leading an effort to restore our Great Lakes. Someone has to – you’ve probably noticed that the lakes’ problems aren’t going away, they’re actually getting worse. There are excellent groups that see the big picture and have had some success getting a few changes made, such as the Sierra Club, League of Conservation Voters, Clean Wisconsin, and the Lakeshore Natural Resources Partnership, and many others. To date, however their efforts have not been co-ordinated with the other states and provinces, or even within Wisconsin. The Environmental Protection Agency (EPA) is planning to establish a board to coordinate all the efforts, but they only control one side of the lakes. Only the IJC has authority in both Canada and the US. As of this moment, no-one focuses on the Great Lakes exclusively. There are of course good reasons/excuses for this – there are lots of things to do that don’t involve the lakes directly, and there are two sovereign nations with jurisdiction over the Great Lakes. We feel strongly that if WGLC doesn’t focus on the lakes, we’ll become just another one of those many other groups, and no-one will speak for them. The new website will help change our image from that of a small group with limited resources to a multi-national one that will focus on the lakes. Look at this as Step 1 in our efforts to bring the major Canadian and American organizations together and see if we can’t get more attention paid to the needs of the lakes. We strongly encourage you to use your e-mail. A document mailed through the USPS costs us about a dollar, but an e-mail costs next to nothing. And for those of you out there who aren’t computer experts, we’ll still use USPS whenever necessary to get the word out to you. Know how we’re always pestering you for money? Well, we’ll keep doing that, but we’ll make it easier for you. The new website will let you send donations and dues to us electronically. And, they should be tax-deductible. We’ll soon be applying for an IRS status called 501(c)(3). This is the IRS tax status which allows people and organizations to deduct any money they give us. The reason we’re doing it is that we’re also applying for a grant to staff and manage our organization effectively, and grantors don’t grant unless they can deduct. We’re requesting money for more mailings, more trips to meetings and conferences, and more reach-out to you. We want to build the membership to about 1800 dues-paying members – today we have less than 300. We’ll have a clerical person to keep up our address list, organize meetings, and help members. We think you’ll like it. But there’s also bad news – isn’t there always? There are probably quite a few of us who remember that old Kingston Trio song. It was popular back in the 60’s, the days of the bazillion dead alewives. But something has changed – if I were to write it today, the title would be ‘Where Have All the Fishes Gone?’ This is a sad tale, folks. 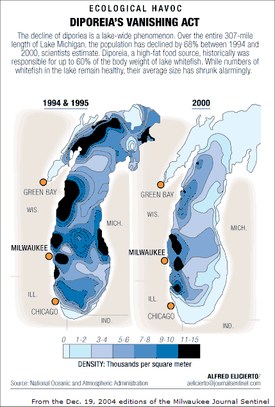 In a nutshell, what’s happening is that the food chain in Lake Michigan is rapidly being destroyed. My guess is that in three-to-five years the salmon and trout population will be seriously reduced. Even the alewives will suffer. There will still be a viable but small population of these fish thanks to the stocking done by Michigan and Wisconsin, but not like the good old days. The reason? In one oversimplified word, mussels. It’s already happened in Lake Huron – they have very few salmon left. Now it’s started here. And as I write this, there is no known solution. Remember the summer of 2010 when we had a large alewife die-off, ala the 60s? That happened because very favorable spawning conditions existed then so the alewife hatch was high. But that summer, warmer waters and a lack of the plankton and other little critters that the alewives eat killed them off when they came in to shore to spawn, causing us to be out there on the beach again with rakes and shovels. Check the chart below and you’ll see how the population of the major food source, a small shrimp-like animal called diporeia, has dropped over the years. So what happened to all those little critters? Many people believe that phosphorus is the problem because it adds so much nutrient to the lake. It is the problem in the case of cladophora, but the die-off of the lower levels of the food chain is a little more complex. To give you another look at how serious this is, the Wisconsin DNR and the Michigan DNR (DEQ) have gone so far as to cut back on the quantities of salmon they’re stocking. And this isn’t a token reduction, either – Wisconsin is stocking 31% less than previous years and Michigan, about 62%. The reason for the big difference between the two states is that Michigan is getting more natural reproduction than we are. That’s because they have more rivers entering the lakes than Wisconsin does, and bigger ones, too. Actually this is good, because when the stocking program began no-one expected any natural reproduction. The trout and salmon depend on diporeia, and the diporeia depend on plankton for food. And those mussels have to eat too. One average mussel can filter a quart of water a day, and once the plankton is almost gone, the little critters starve too, and the food chain will be irreversibly damaged before we find a solution. The UWM Great Lakes WATER Institute has been working hard on this, but as yet there’s no known way to get the mussels out of the lake. A company in California has developed a bacterium that attacks zebra and quagga mussels, but so far it hasn’t been adequately tested. And even if it works, how do you treat a huge area like the Great Lakes? Zebra mussels lived on rocky bottoms in shallow water, so we might have had a chance of killing them off. But the zebras are almost gone, replaced by quaggas. They live over the entire bottom of the lake, so you can imagine the cost and logistic problems getting rid of them. Just to make sure you don’t come away from this newsletter thinking phosphorus is evil and mussels are the only enemy, here are a few more tidbits of information for you. Over the last 20 years or so several other changes have occurred in our lake: prevailing winds, which used to be southwest, are now northwest; the average nearshore water temperature in Wisconsin has increased by about 3º C (a little over 5°F); over 180 aquatic invasive species (AIS) have invaded the Great Lakes basin; water levels are trending downwards while water clarity is trending up; and of course we have the cladophora problem. Trying to sort this all out and come to an answer that we can all live with will take a lot of time and money. In the meantime, I believe – and I’m not an expert, I just talk to them – that the salmon fishery in Lake Michigan has about four to six years to go before the salmon fishery is seriously depleted. Not all of us fish, but the sport fishing business in Wisconsin is huge. Think of the boats, captains and crews, motels and restaurants, and other businesses that will be affected. We have enough economic problems in Wisconsin without adding this, but based on what we know at the moment, the trout and salmon, and maybe even the perch, will be scarce in four to six years. In Lake Huron, the salmon are already gone. What should we do? Cutting down on phosphorus entering the lake will definitely help, especially with the cladophora. We’ll also push the DNR to begin enforcement of the phosphorus law. 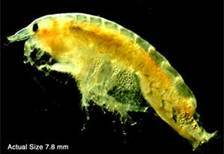 Some of you have asked what happened to the lakes and inland seas in Europe where these creatures came from. I was surprised to find out that their mussel populations have dropped way off, and their cladophora grows only in small clumps of less than an inch. That’s because other fish eat the mussels and the cladophora. And, the phosphorus content of the water is reduced because there are fewer mussels to produce it. That keeps the cladophora growth down. These lakes have adapted to the influx of invasives, so over time things have balanced out. In our lake, round gobies eat mussels, but only small ones. We believe that the Great Lakes will adapt too, and eventually both the mussels and the round gobies will have their numbers greatly reduced. I know this sounds like wishful thinking, but the scientific community believes this is the best solution, so that’s what they’re proposing to do. But even they aren’t sure what will work: the lake has already changed so much that most of it we simply don’t understand. Folks, it’s time to get out that pen and use its power. Send the letters to our senators and representatives in Washington. Hand-written letters are best, next best are phone calls. Be polite, brief, but firm. Mention the Wisconsin Great Lakes Coalition and the 30,000 people who own property around the lake. We have the power to make them act, but if we don’t use it, it’s as good as lost. A round goby. In the nearshore zone the bottom of the lake is practically covered with them. After all, they’re in goby heaven right now. A big one is 4 – 5 inches long, so they can only eat the small mussels. But eventually the populations of the species involved will balance. Our lake will be fundamentally different, though. How different we don’t know yet. You may recall that this is the state’s re-write of its shoreland management regulations. Last fall all seemed to be moving along well, but then the DNR announced that it was making some changes and counties should not proceed with whatever they were doing until those changes were published. Public reviews of the new document were reviewed in September and the Natural Resources Board approved it last month. I’ve only looked at Sheboygan County, but if you call your county planning office they can tell you what’s going on. Two major changes affect us – first, only 15% of our property from the OWHM to a point 300 feet inland can have an impermeable surface. Gravel roads and parking are considered impervious. Second, we can now expand our cottage or house up to 35 feet, meaning we can add a floor. Mitigation – changing something else on our property to make up for something in the regulation we can’t meet – will be available upon appeal to the County Board. And what about the Asian carp? Haven’t heard much about them lately, have we? That’s because the electric barriers are working and no more new carp have been found above them. There was some downtime a few months ago, 13 minutes total, during which both the two primary machines and the single back-up machine were down, but apparently nothing got through. The Corps of Engineers (USACE) is studying other ways to keep the carp out of the lakes – ultrasound and others – but I doubt they’ll find anything soon. The Army Corps of Engineers has asked for money and five years to study the alternatives to keeping the carp out of the lake. The Senate and House have written identical bills asking the corps to move faster. Even the Canadians are getting concerned – they’ve just appropriated money to study ways to keep the carp out of their waters. As you know we have budget problems, but it looks like another $300 MM will be appropriated for GLRI this year. Some of that will be used for carp control. In the meantime, other places have been found where the carp may be able to get into the lakes – Eagle Marsh in Indiana is the big one. You’ll hear more about this in the coming months. This year we’re planning to have our meeting at a central venue, as we did last year. We have two new board members to introduce to you, and we’ll bring you up-to-date on all the things happening around the lakes. We haven’t got a date yet but April is a good possibility. We’ll send out a notice as soon as we have the details worked out. That’s it for now, people. Don’t forget: you are the hope of all the kids and grandkids that will come along after we’re gone and may never have what we’ve had. Don’t let them down. Keep those $$ coming! And don’t forget your e-mail!